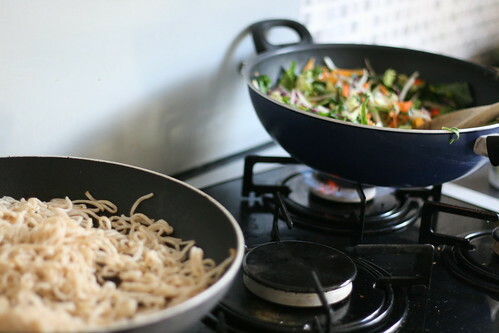 The older I get, the more I appreciate stir fry veg. And the lazier I get, the more I appreciate the bags of ready-prepared stir fry veg you can buy in ASDA. Three minutes in a hot frying pan and you’ve got a meal. Yum. But you can’t just have the veg, you need something to go with it. 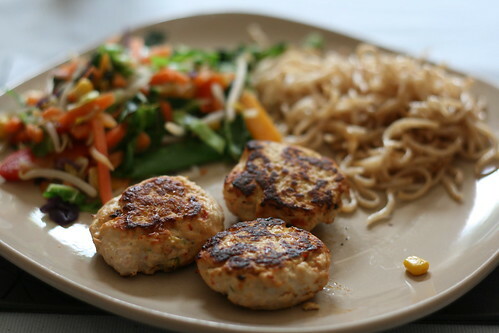 And these Thai Style Chicken Cakes fit the bill nicely. 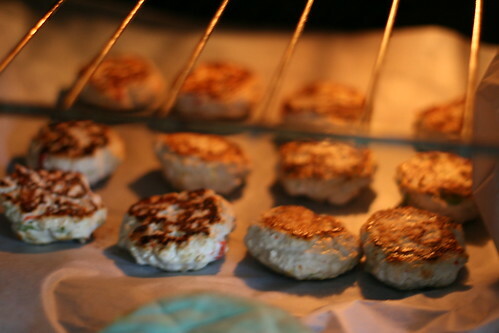 They’re not difficult to cook — a bit of a faff maybe — and they are very yummy. The only problem I had was that they were a bit dry. It wasn’t anything that a healthy dollop of light mayo couldn’t sort out, but I’m not entirely sure how to remove the dryness from the cakes. Anyway. They are yummy, and quite impressive to serve — they look so cute! Pre-heat the oven to 220C and start prepping everything. 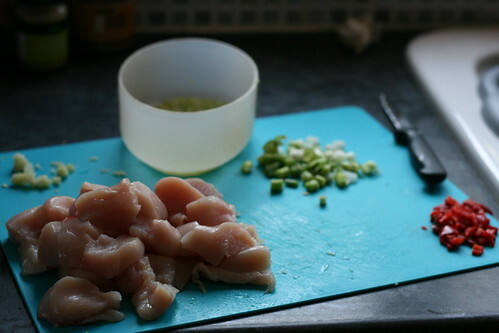 Chop the chicken breasts into rough chunks, peel and crush the garlic, finely chop the spring onions, grate the zest of the lime and deseed and chop the chilli. 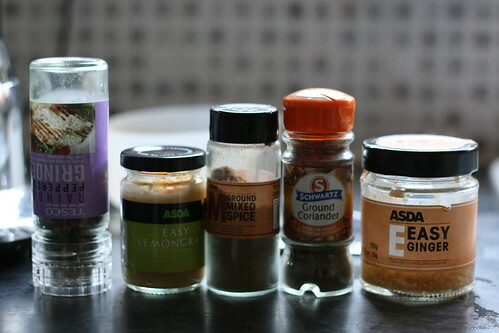 A twist of pepper, a teaspoon of Easy Lemongrass, some mixed spice, a teaspoon of ground coriander and a teaspoon of Easy Ginger. It still tasted yummy, even taking the cheat’s way. This paste needs to be shaped into 12 little cakes. 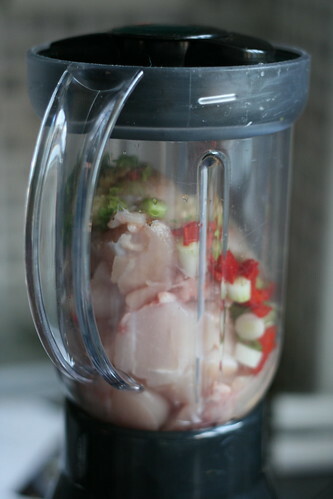 This is completely disgusting (raw chicken in paste form — bleh) but also quite satisfying. And they do look sweet. 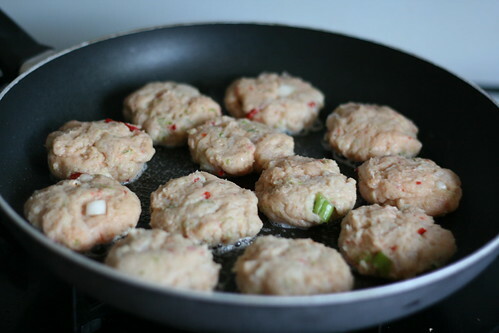 Then place the chicken cakes in a large, non-stick frying pan that’s been sprayed with Fry Light. Fry them for two minutes, then flip and fry on the other side too. 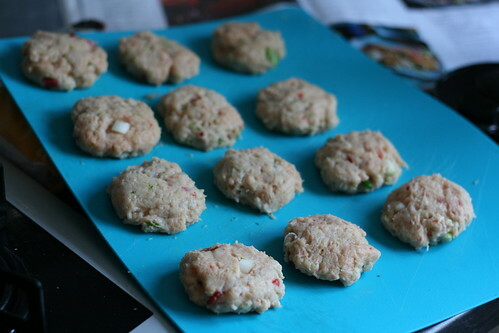 Then they just need to be baked in the heated oven for between 6 and 8 minutes. See what I mean? Ever so cute! And scrummy too. 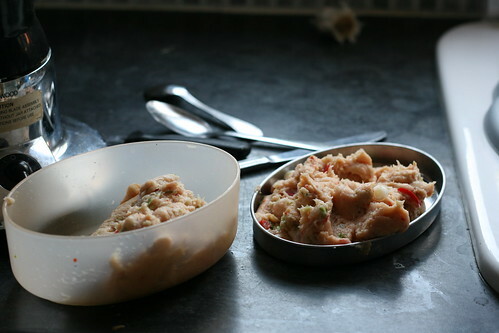 Nice and filling, but light too — you don’t feel bogged down or heavy after eating it. There’s a few more photos here. Let me know if you have a go at making them yourself! Ohh I am most definitely going to try this! 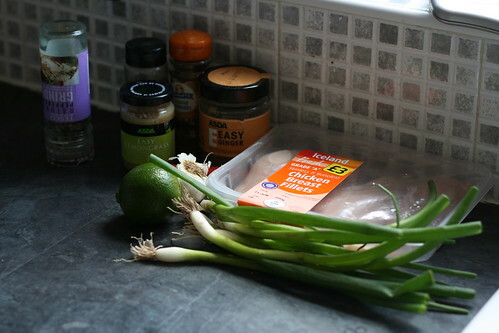 However, I might use lean turkey mince instead of chicken and blending it.